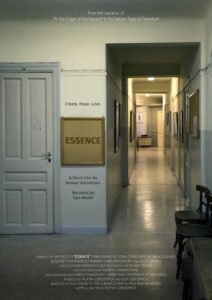 According to the film’s creator, Roman Gerodimos, ESSENCE (2018) was born from a letter from a teacher and scholar written in the twentieth century and passed down from teacher to student for a generation. Gerodimos seeks to create a visual and aural rendition of this essay, which aspires to show how a vision of truth—or, essences of things—is made knowable through art and thought. For both the filmmaker and essayist, art plays a distinct role in imagining beauty, creating harmony from chaos, and synthesizing generations of thought to cultivate the minds of future generations. The essayist notes that art and truth are humanity’s responsibility; he claims, “We have a responsibility to respect and nurture this vast body of knowledge” against the volume of lies, misinterpretations, and the machines of ignorance. According to the piece, no one can put on these responsibilities on an individual. Instead, they are a part of the inborn obligations of being human. In the film, the images attempt to match the directives espoused in the essay. We see figures move through time and space, at different locations all over the world. A young woman travels through the park, a library, and through complicated hallways and staircases. The film is accompanied by beautiful recordings of Bach, Schubert, and Brahms, unsurprisingly, since the students and teachers involved in the piece are musicians. However, the images seem to suffer from a sense of literalness. The essay asks us to look up (metaphorically, one assumes), and the figure in question looks up. While some of the film’s images do attempt to reach toward the sublime, most stick with moments of quotidian existence. While that is fine, and may, in fact, be part of the short work’s larger gesture toward the responsibility of each individual to work toward understanding the essence of himself and the world. However, the film would be more successful if it gestured toward the essence of cinema, which has long been thought to reveal meaning through metaphors rather than literal interpretations.